Boil and Bubble, Toil and Trouble . . . Uh, don’t think she is staring at President Trump in admiration. Unfortunately, she pretty much has a one-note expression when someone gets the best of her. And, Now a Few Reasons Why We Should Vote Red . . .
White, Married Women are Weak? Hillary Clinton is continuing her over a year-long hate tour on the subject of why President Trump stole the election from her. Of course, it has nothing to do with what she was promoting or the continued shadows of doubt covering her past and present actions. Nope, she didn’t take any of that into considering believing she was the best thing that could happen to the country and she had earned the right to be the first female present. She went way out of bounds on her visit to India. In the year 2018, that she could claim such rampant white male chauvinism in declaring that said white males turned the election against her by forcing their wives, mothers, and sisters to vote for Trump . . . or else. Uh, or else what? What you tell someone your vote is, doesn’t mean that is actually where your vote went. In addition to laying claim that white women are aided, abetted and forced to vote for the candidate of their choice rather than letting the woman decide her own vote is pretty weak. In some of my encounters, pre-election, I knew a lot of females who were asking that their husbands vote for Donald Trump. Hillary Clinton seems to feel that challenging President Trump in the next presidential election will solidify her fan base and she will ultimately triumph. Seems to me that the voters spoke in 2016 and even with all the scheming, lies, and voter fraud, she still lost. 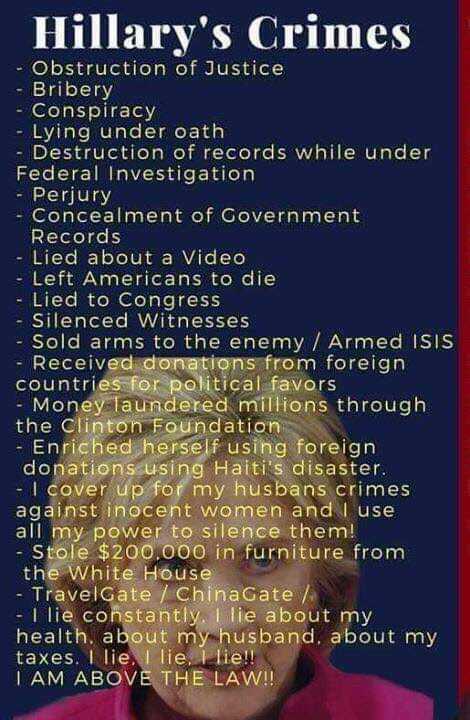 Besides, I’m thinking the world has grown up more since 2016 and if they end up voting this woman into office after all, they will deserve what they get.